Here are this year's nominees for THE CRITICS CHOICE AWARDS, which will air again on VH-1 on January 14, 2011. Since it usually appears at the bottom of such lists, I've taken the liberty to elevate the nominees for BEST SCORE to the top! The rest of the nominees follow of course. So what do you think? Wouldn't be much of a surprise if this list mirror's the Oscar nom list...with the exception of Tron: Legacy. Feel free to post a comment below. 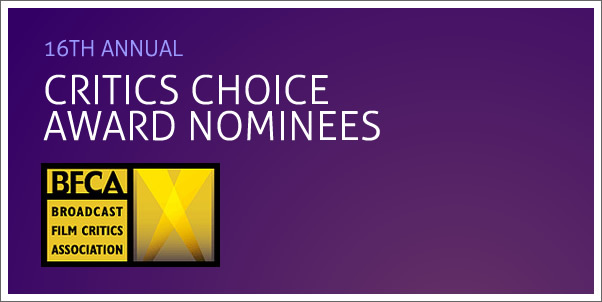 Today, VH1 also announces the launch of its Critics’ Choice Movie Awards site at CriticsChoice.VH1.com. The site offers movie fans detailed information about the show and this year’s nominees, VH1.com’s Award Season Twitter Tracker, where users can see the awards show buzz that’s happening on Twitter in real time, and Quick Critic, an opportunity to share short film reviews for a prize that includes a trip for two to next year’s Critics’ Choice Movie Awards. Additionally, interviews with many of the acting nominees can be found on the BFCA's site CriticsChoice.com. The Broadcast Film Critics Association (BFCA) is the largest film critics organization in the United States and Canada, representing 250 television, radio and online critics. BFCA members are the primary source of information for today's film going public. The very first opinion a moviegoer hears about new releases at the multiplex or the art house usually comes from one of its members.